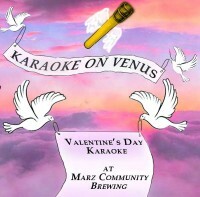 Croon a Valentine's Day duet with your sweetheart at Karaoke on Venus, 8 p.m. to 10 p.m. on Thursday, February 14, 2019, at Marz Community Brewing Co., 3630 S. Iron St., Chicago. This special Valentine's Day karaoke session will let attendees channel their inner Sonny & Cher, as well as engage in a karaoke duet throwdown showdown. Special taste bud stimulation is on-hand from Chef Tony, who will offer a special aphrodisiac-heavy menu all day on Valentine's Day.